Sometimes nothing comes to my mind when I start to blog. Today my mind is blank. It reminds me how I have become lazy without posting any recipe in my blog though I have plenty of time. :-( So, without dragging further I am directly going to recipe today. 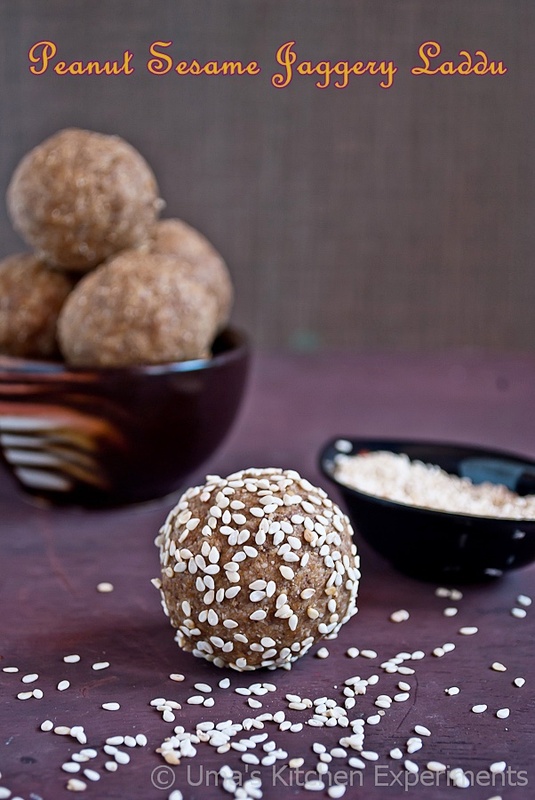 Peanut and sesame seeds laddu is today's recipe. As the name says in the picture, it requires only 3 ingredients and 15 minutes of your time to prepare it. Its a simple dish that goes good with the snack box of office goer's and school children. It gives an instant bout of energy and it is much hygienic than other snacks. 1) Dry roast the peanuts uniformly in a heavy bottom pan. When the color starts turning brown, remove it from fire and allow it to cool down completely. Rub it in between your fingers and peel off the skin. I got plain peanuts without skin and hence roasted it slightly. 2) Dry roast sesame seeds till it crackles and releases nice aroma. Do not over roast it, otherwise, it tastes bitter. Allow it to cool. 3) While both peanut and sesame seeds are cooling down, grate/powder the jaggery. Keep it aside. 4) In a mixer, take peanuts and sesame seeds together and grind it to a powder. You can also grind it coarsely. 5) Add jaggery and continue grinding till all ingredients mix well. It takes just few seconds. 6) Transfer this powder to a plate and shape into lemon size laddus using your palm. 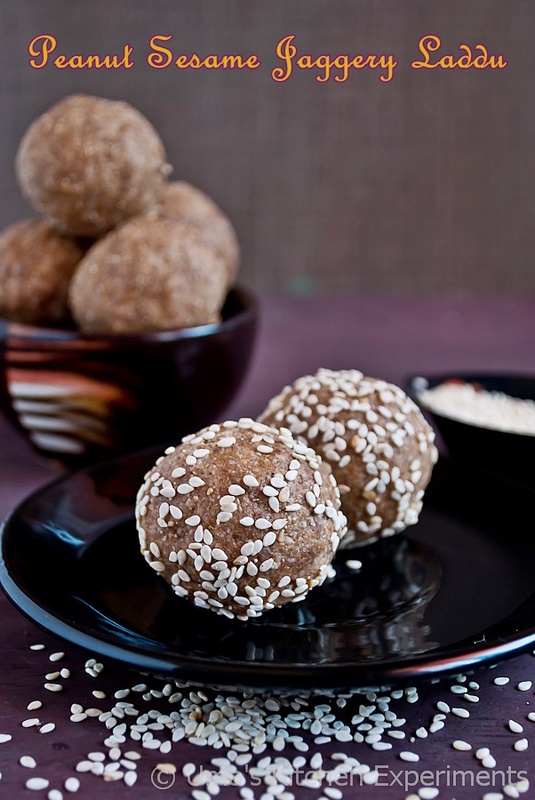 The oil that releases from sesame seeds and peanut while grinding is sufficient to bind the laddus. No need to add extra oil. 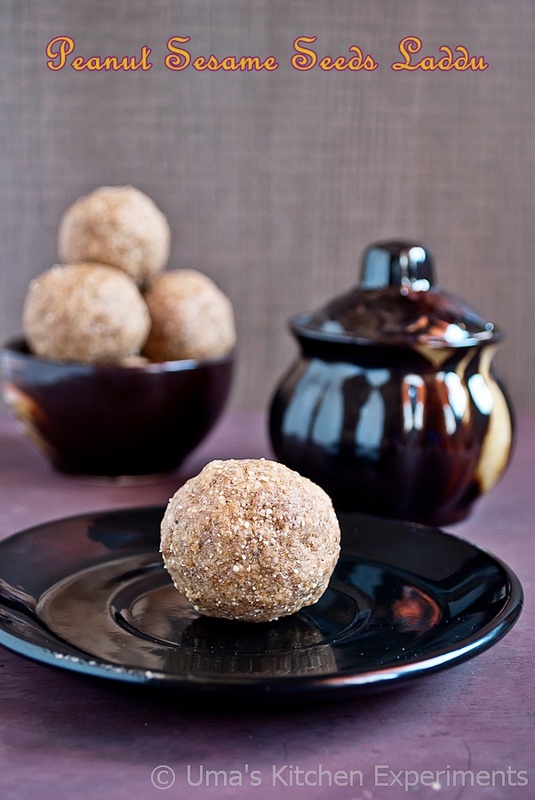 7) Enjoy the peanut sesame laddus. It stays good up-to a weeks time in room temperature. 1) Instead of white sesame seeds, you can also use black sesame seeds. 2) Adjust jaggery as per your taste. 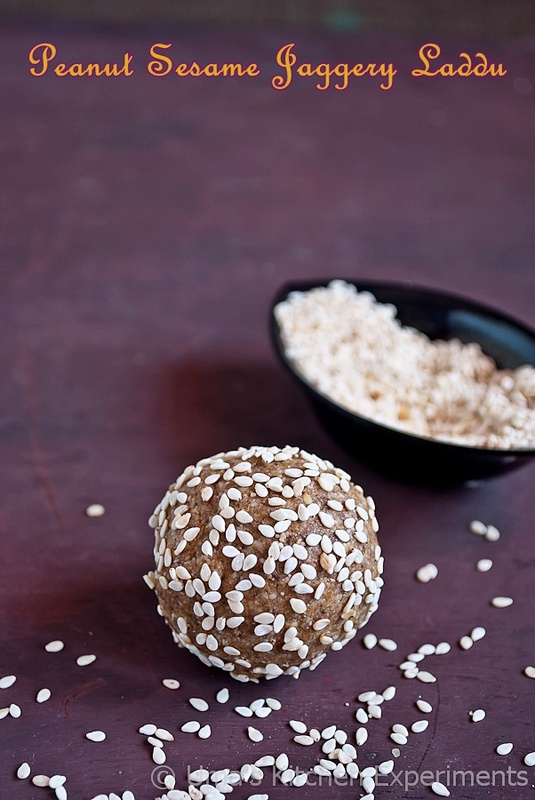 3) You can also roll this laddu in sesame seeds or crushed peanuts at the end.